It feels like summer already–after approximately one week of spring weather. So I would rather not fire up my oven, but eat salad more often instead. A salad a day is my goal, though I’m been rather lazy in pursuing it. So this time we have not just any salad, but one fit for a meal. And a fine one at that. To make this citrus-kissed salad even simpler (and grain free), you can leave out the wild rice. But I couldn’t resist it’s nutty allure, and I found some, providentially tucked in among my stash of bulk bin purchases. My husband says I have a bulk bin addiction, and he’s probably right. I requested to go to the bulk food store on my birthday. However with results like this, I don’t regret my hoard one bit. I do occasionally wish I kept things better organized. The cherries and pecans came from a more recent trip, and I was happy to locate them. I was not sure what I would use them for when I bought them. But then everything came together in one glorious, serendipitous medley. Does that ever happen to you? 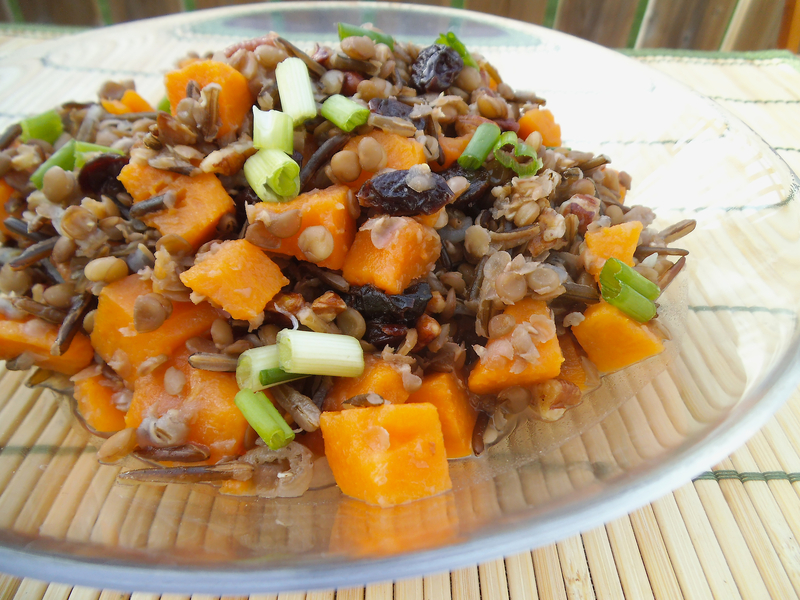 Make it so–with this lentil, wild rice, and sweet potato salad. Bring 6 cups of water to a boil. Add wild rice. Turn down to simmer and cover pot with a lid. Simmer for 15 minutes. Meanwhile, in a separate pot or pan, cover sweet potato with water and bring to a boil. Cook until fork-tender but not too soft. Drain and let cool. Add lentils to simmering water and wild rice. Continue to simmer with the lid on for 25 minutes. Turn off heat. Drain cooked lentils and wild rice well. Set aside to cool. To make the dressing, heat a medium skillet over medium heat and toast pecan pieces for 2 to 3 minutes, stirring frequently. Transfer pecans to a non-reactive, heat-safe bowl. Add 2 tablespoons oil to the warm skillet and saute shallot for 2 minutes. Turn off heat. Pour warm shallots with oil over pecans and allow to cool. Mix in orange juice, salt, and vinegar. Combine sweet potato and dressing. 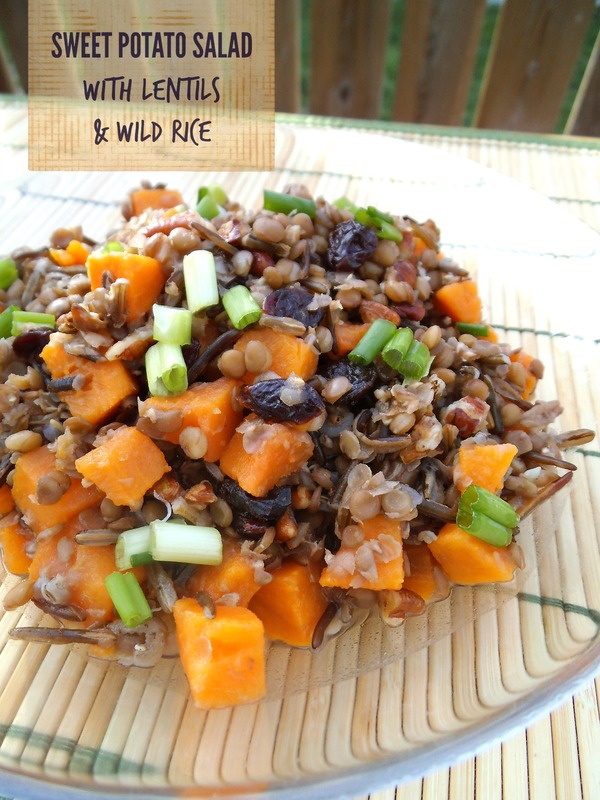 Stir in dried cherries, lentils, and wild rice. Cover loosely and chill for 60 minutes or longer. Just before serving, toss salad to redistribute dressing and garnish with green onion. What a beautiful, filling salad! That’s awesome that you wanted to go to the bulk food store on your birthday – I can definitely see myself making a similar request. Yum! Gorgeous salad, and looks so delicious! Thanks! It makes a nice, healthy meal. And it makes a gorgeous-looking salad, too, doesn’t it? Tell your husband I have gobs and gobs of bulk bin goodies, er, a well-stocked pantry ;-)! I was so happy to find your salad recipe! Got any pantry organizing tips? Mine’s a mess. I wish…My solution is plastic bins – not the best, but it works. So each bin is marked with what’s in it: bags of beans, boxes of tea, grains, flours, etc. And then I have a large shelf in my kitchen where I have glass jars filled w/ my most used items like various flours, beans, dried fruits, grains. That sounds like a delicious salad – all of my favorite flavors! I find that sweet potato works really well with orange dressing. The first sweet potato salad recipe I tried (from a recipe book) included green apple and was also very good! This looks delicious! I love sweet potato and I bet it combines wonderfully with the shallots & cherries – never tried this combo! I’ll try to sharing something next week. Thanks for stopping by this week! Lovely, what a wonderful and delicious combination. Love! Putting it on my list of to do’s. Thanks for sharing!